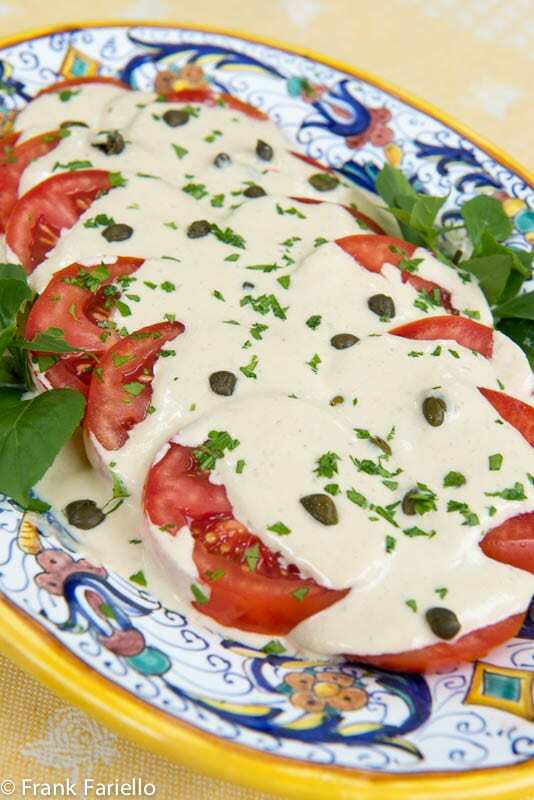 Vitello tonnato (Tunnied Veal) is one of my favorite summer dishes, but I had never thought about other uses for tonnato sauce until I saw a Facebook post by fellow blogger and Tuscanycious honoree Judy Witts Francini. (You definitely shouldn’t miss her fabulous Divina Cucina website.) Judy’s post mentioned she was going to make Tomato Tonnato for dinner—and suddenly the proverbial lightbulb went off. What a great idea, I thought to myself, and why hadn’t I thought of that? It was so very obvious—tomato and tuna are a classic combination—but, as the Italians say, it was like the l’uovo di Colombo, or the “egg of Columbus”—it seems so obvious once you think about it, but you need to have thought about it! In any event, Tomato Tonnato is the ultimate spur of the moment summer dish. The sauce is basically tunafish and mayonnaise blended together with capers and anchovies, just like the one for vitello tonnato, except that instead of thinning the sauce out with braising liquid, you add fresh lemon juice. After you’ve blended all the ingredients together, you pour the sauce over sliced summer tomatoes, garnish with some parsley and basil for color if you like, and voilà! The whole recipe shouldn’t take more than 15 minutes tops—and once you’ve done it once or twice, more like five minutes. And unlike vitello tonnato, there’s no waiting around. You can and should eat your Tomato Tonnato right away. Tomato Tonnato makes for a fabulous antipasto, light main course or buffet dish. Lay out the tomato slices decoratively on a serving platter. Blend all the ingredients for the tonnato sauce in a blender until absolutely smooth. The mixture should be thick but pourable; if not, add a bit more lemon juice. Taste and adjust for salt, although it shouldn’t need much. See our post on vitello tonnato for detailed, step-by-step instructions using homemade mayonnaise. Pour the sauce over the tomato slices and around the sides. Unlike when making vitello tonnato, you don’t need to be careful to cover the tomatoes entirely with the sauce. In fact, it’s nice to leave some exposed for color. Sprinkle the top here and there with some capers and the minced parsley. Decorate with basil leaves if you like for more color. Serve immediately. Tomato Tonnato is an easy going dish and just about any kind of tomato will do nicely. Garden grown or farmer’s market tomatoes are best, of course. But the sauce is so tasty that even indifferent supermarket tomatoes will shine. As for the tuna, the finer the the better, but you don’t have to to splurge on incredibly expensive imported ventresca. A decent canned tuna packed in olive oil will do you just fine. While the whole dish can be made ahead and refrigerated until you’re ready to serve, your Tomato Tonnato will lose it freshness and the juice of the tomatoes tend to run into the sauce. Better to make the sauce ahead and assemble when you’re ready to eat. And really, the thing is so quick and easy it’s really no bother at all to make it at the last minute. A more conventional take on tomato and tuna combination would be pomodori ripieni di tonno, or tomatoes stuffed with tuna, which can either be made with raw ingredients and served cold or baked in the oven. And for Judy’s mayo-less version of Tomato Tonnato, click here. From this story comes the expression È come l’uovo di Colombo—”it’s like Columbus’s egg”—to describe something that seems easy or obvious once you actually think of it. Blend all the ingredients for the tonnato sauce in a blender until absolutely smooth. The mixture should be thick but pourable; if not, add a bit more lemon juice. Taste and adjust for salt, although it shouldn't need much. See our post on vitello tonnato for detailed, step-by-step instructions using homemade mayonnaise (see Notes for link). Pour the sauce over the tomato slices and around the sides. Unlike when making vitello tonnato, you don't need to be careful to cover all the tomatoes with the sauce. In fact, it's nice to leave some exposed for color. What a great idea. I will try it. I love tomatoes and vitello tonnato! Have a great Sunday Frank ! Thanks, Paola, same to you! Like you, Frank, I can’t believe I haven’t thought of this before. I have used chicken and turkey but tomatoes is brilliant! I had my first vitello tonnato was on a blistering hot and humid day in a village outside of Florence after touring a Medici villa. It was a transformative moment, to be sure. That first experience of a tonnato dish is definitely memorable! Hope you try this one, David. This was fantastic, Frank- if it is okay with you, I will write a post on this and link back to (and credit you!) to your recipe. This is a wonderful summer dish! I’ve never heard of this before, Frank! Not even the veal version, but if it’s a Northern Italian dish, that’s probably why. Looks lovely and yet another way to use those bountiful summer tomatoes! Thanks Christina. I make it quite often now—it’s a great quick meal when I don’t feel like cooking which happens even to me! EXCELLENT RECIPE. Like so much Italian food, the brilliance is in the simplicity. I knew the Columbus anecdote, I used to tell it to my students so they would understand innovation, things only seem obvious once you’ve become used to them. However, I always understood the event took place in a coffee house! Hi frank! I wonder if yogurt can substitute or at least combined with mayonaise? Thanks. Sure. I haven’t tried it but I don’t see why not. Why not give it a go and let us know how you like it? It looks absolutely delicious and what a wonderful idea! When it is hot outside there is nothing like a cold plate. Highly nutritious, extra tasty plus the kitchen stays cool. I used to make cold plates all the time in the summer, especially when I’d take the kiddos swimming. I would prepare the plates ahead of time and when we’d get back home the meal was already prepared. Thank you for sharing. Have a great weekend. Cold plates really are a lifesaver at times, aren’t they? This is brilliant. While it is not vegetarian, I have several “semi-vegetarian” friends (who eat some fish, and organic free-range poultry) who would eat this, but not the veal dish. But I’ll keep it for tomato season, or at least until some quality hothouse tomatoes roll in. Thanks, Maria! And you’re absolutely right about the tomatoes. They make the dish. Never knew the origin of that saying even though I have heard it used a million times. Also never thought of substituting the veal with tomatoes, but it is such an obvious combination. Will try it, as I LOVE salsa tonnata. P.S. Did you know that traditionally, salsa tonnata is apparently not made with mayo? You are supposed to use hard-boiled eggs… I couldn’t believe (even though I read it in Artusi’s recipe!) it so I tried it and it actually worked! I had heard about it, but I never did try it with hard-boiled eggs. Will definitely give it a go before the summer’s over! I just love this – guess what we will be having for munch today…. What a brilliant idea Frank – something I’ve never tried or even thought of. Now that my tomatoes are rolling in, I’ll be trying this soon. Thanks, Linda! Let us know how you like it. Now; that being said this combo with tomatoes is much easier, lighter and it’s perfect for the summer! Hey Panos and Mirella! Thanks for stopping by. I bet this dish would be heaven washed down with some ouzo… but then again, so would just about anything, lol… 😉 Enjoy! What I need in a hot summer day! Love it!!! You are the best. Will make this on the weekend. Thank you. Aw, shucks… 🙂 Do let us know how you like it! L’ovo di Colombo without question… wonderful recipe for summer tomatoes from my garden. With those tomatoes it’ll be extra special. Do give it try, Diane. It’s very nice! Absolutely perfect. It’s hot. Our tomatoes are in. I think this will be made again and again. This is so very Italian — simple but delicious. It’s been years since I’ve made mayonnaise at home but this recipe is a great inspiration to do so again. Grazie per la ricetta! una splendida variante estiva al vitello tonnato, voglio farla anche io!Buon weekend Frank ! woah!..this is really Italian home coookin! the sort one hardly reads in English books/magazines…. I takes me back donkey yrs ago when my dad used to make during the hot milanese summers…. if the salsa tonnata is kept on the firm side one could also stuff tomatoes with it. I like the idea of eggs tonnato… that may be next on the list! I have had eggs and tomatoes prepared the way Stefano describes. Salsa tonnata is quite versatile. Your plate of tomatoes looks lovely, Frank.